The part before the @ is the mailbox name and the part following the @ is the domain name. 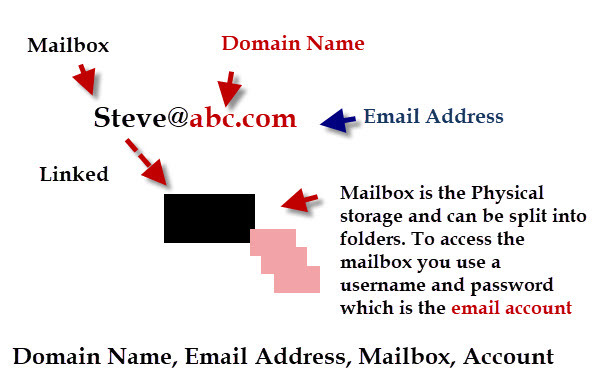 The mailbox name links to physical storage on the email server to the email address. Normally there is a 1 to 1 relationship between the mailbox name and the storage. However, because it is linked then multiple email addresses can be linked to the same physical mailbox. An email account is a username and password combination that gives you access to a mailbox where your email is stored. Personal email addresses using Yahoo, Gmail etc use the Gmail or Yahoo domain name. Business email should use their own domain name and this domain name can also be used for the website address. Although mailbox names are strictly speaking case sensitive most email providers don’t implement this rule so although the mailbox names Steve and steve should be different they normally aren’t. So email sent to either Steve@abc.com or steve@abc.com would be delivered to the same mailbox. Although many so called special characters are allowed, but some can cause problems. The most common special character is the . (dot). I would recommend that you don’t use any other special characters.